Austrian theatrical director; born at Vienna Aug. 18, 1838. Neumann went upon the stage in 1859, as a barytone, appearing at Cologne, Cracow, Oedenburg, Presburg, and Danzig. 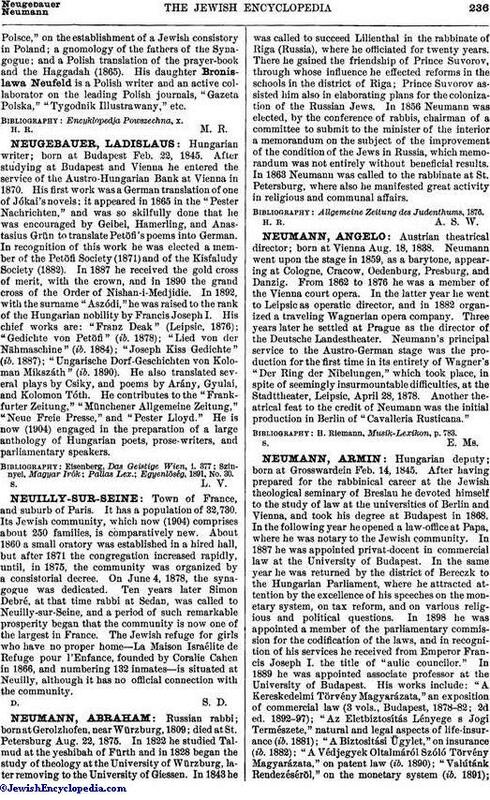 From 1862 to 1876 he was a member of the Vienna court opera. In the latter year he went to Leipsic as operatic director, and in 1882 organized a traveling Wagnerian opera company. Three years later he settled at Prague as the director of the Deutsche Landestheater. Neumann's principal service to the Austro-German stage was the production for the first time in its entirety of Wagner's "Der Ring der Nibelungen," which took place, in spite of seemingly insurmountable difficulties, at the Stadttheater, Leipsic, April 28, 1878. Another theatrical feat to the credit of Neumann was the initial production in Berlin of "Cavalleria Rusticana." H. Riemann, Musik-Lexikon, p. 783.